In the first Captain Sillyvoice adventure we included a parrot for readers to find in each scene, not to mention the mischievous mice popping up all over the place. In the next story we added the cheeky monkeys. In the new book, Captain Sillyvoice and the Sea Monster (coming soon! ), we will be introducing a fantastic little frog. There is more trouble ahead for Captain Sillyvoice and his awesome pirate crew. Check out my latest review on ReadItDaddy! 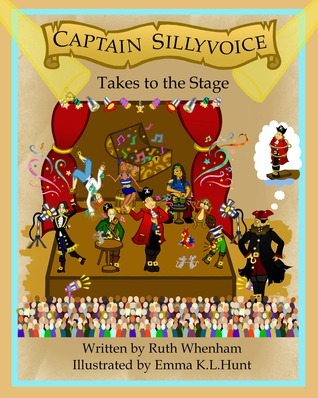 Captain Sillyvoice Takes to the Stage – NEW BOOK OUT NOW! The new Captain Sillyvoice adventure is now available to buy in paperback or e-book format. Hardback copies will be available shortly. I hope that those of you who have enjoyed my first Captain Sillyvoice adventure will find this second story equally entertaining. I would love to hear your feedback! With thanks to Emma K.L Hunt, who has once again created a fantastic set of illustrations to accompany the story. New Captain Sillyvoice adventure out soon! The proof copy of the new Captain Sillyvoice book is winging its way to me for final approval. All very exciting! To whet your appetite a little, here are a few sample pages. You will notice that this story features some new characters, including the big and mean Captain Scaryscar.